Roosebeck 36.5 Inch Parisian Harp 22 String Walnut + Extra String Set & Tuning Tool. 22 string Parisian Harp. 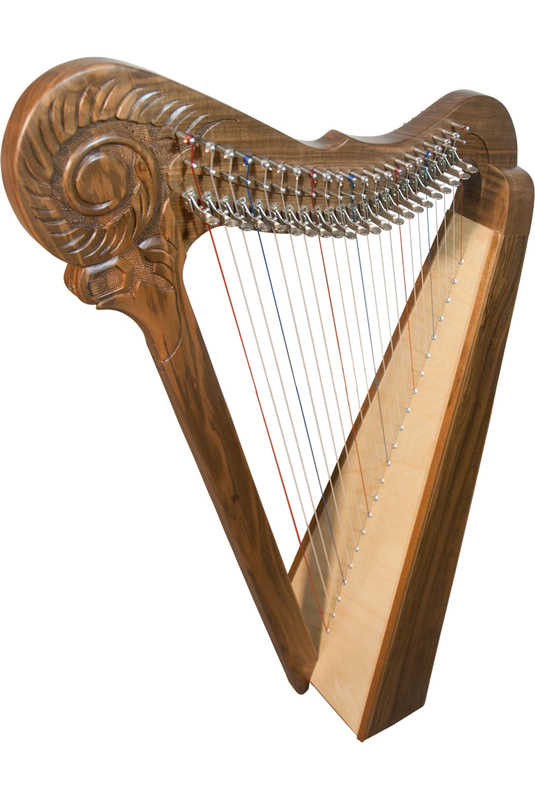 This is a stylishly designed harp, in solid walnut with a spruce soundboard. There are 22 DuPont Nylon strings with full levers. The simple straight lines of the pillar and softly curving lines of the arm are joined by the hand carved scroll. The carving is very organic giving the appearance of a fiddle headed fern. The effect is a strong bold design and a soft outline. The harp stands approximately 36.5 inches tall and weighs about 12 pounds. The strings range from C an octave below Middle C to High C.
Includes tuning tool and extra string set. Will fit our Roosebeck Minstrel Harp™ Nylon Gig Bag (HMNC) sold separately.